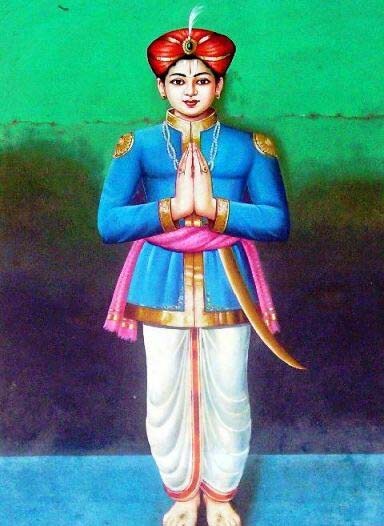 Kulaśekhara Āḻvār was born as a prince to Chera king Dhidavrathan and Nādhanāyagi on the same month and nakṣatra as that of Lord Rāma. The child when born looked divine and made everyone happier and cheerful. The entire kingdom was in a jubilant mood. The child was named Kulaśekhara and when he grew he was taught all śāstras, epics, arts, Tamil and Sanskrit and was also given training on fighting, Horse riding, Elephant riding, etc. In each endeavour, he excelled and came out very successfully. People were very happy and there was rich harvest throughout the year; there were regular rains and there was only prosperity everywhere in his kingdom. The citizens had much love and respect for their king Kulaśekhara. Once without knowing Kulaśekhara's strengths, the neighbouring kings (Chola and Pāndyā) came to fight and during the battle Kulaśekhara won with no difficulty. Impressed Pāndyā king gave his daughter to Kulaśekhara in marriage. Kulaśekhara was blessed with a son (whom he named Dhidavrathan) and a daughter from this marriage. One night, The Lord wished to divert Kulaśekhara's attention to Him and he appeared as Lord Tirupati Veṅkaṭa in the king's dream and blessed him. He became totally like water on Lotus leaf (water never wets the Lotus leaf) and was ruling the kingdom without any attachment; He was spending his time more and more in contemplation of the Lord and singing Bhajans as well as listening to stories of Rāma and Krishna. He even started disliking the battles since he did not like to see more loss of lives in the battle. He started singing in Tamil and Sanskrit with poems filled with love and Bhakti in praise of the Lord. He spent most of the time only on religious activities and attending discourses. Kulaśekhara was so much attached to the story and stopped the discourse and ordered his generals to organize the army and send the soldiers, elephants and horses to assist his Lord engaged in the difficult battle; the king also readied himself to join the battle to give a helping hand to Śrī Rāma. "O, mighty king, we need not go. The Lord Rāma has already killed Rāvaṇa and is on his way back to Ayodhyā". That made the king happy and he came to normalcy; such was Kulaśekhara's bhakti for Rāma. "Kulaśekhara, I am deeply moved by your readiness to offer me help in the battle. Since you are having blind affection and live for me, you did not realize my Strength. We can win Asuras with no effort; you are acting just like Lakṣmaṇa, who is also attached to me deeply. From today you will be called Kulaśekhara Perumāḷ like Perumāḷ Lakṣmaṇa". Even today he is revered as Kulaśekhara Perumāḷ. The verses he sang were compiled therefore under "Perumāḷ Tirumoḷi". One can see his feeling of deep regret for not being born during Rāma’s time in his verses. As he was getting more and more involved in Bhāgavat Bhakti and Bhāgavata Bhakti and was spending all his time in such activities, the ministers were not clear as to how to bring the king back to administering his kingdom. The king had consecrated a Golden statute of Śrī Rāma in the palace where he was spending most of the time with other pundits and vaiṣṇavas. Once during a Rāma Navamī day (the birthday of Śrī Rāma), the king was astonished to see a big nice Navaratna mālā which had adorned Śrī Rāma missing. He was confused as to how someone can come inside the palace with so much security and so many people around. The ministers were asked about the disappearance of the Lord’s ornament. One of them hesitantly stammered to say "May be..O...king........one of vaiṣṇavas, or these scholars...could..........have.....stolen...it." He did not even finish his statement. "What are you saying? Are you talking about these servants of Śrīman Nārāyaṇa? Are you not ashamed to say that? How dare you think them as thieves when their love is only for the Lord and they consider the Gold and dust the same; - Do you think they have stolen the Mālā?" "If the Mālā has been taken by one of the Bhaktas, let the snake bite me; If not, my hand will come out unscathed." He put his hand inside the pot. The snake never touched his hand. "We are very sorry and we beg your pardon. We are the ones who removed the Mālā and put the blame on the Bhaktas so that you will start disliking them and will concentrate on administrative matters. Please forgive us for this irresponsible act." Such was his love and reverence on Bhāgavatas. He has included special ten verses about Bhāgavata Śeṣatva in His Perumāḷ Tirumoḷi. In one of his verses, he revealed to us that those, who wear the dust from the feet (Thoṇḍardippoḍi) on their heads, do not need Gaṅgā bathing to wash away their sins. In another verse, Āḻvār states that his hairs stand on end over the thought of those Bhāgavatas, who enjoy Śrī Raṅganātha as the Śārṅga Pāṇi and he gets goose bumps, when he thinks about these Bhāgavatas. In another verse of Perumāḷ Tirumoḷi, Āḻvār expressed his deep desire. He revealed that his prayer was to lose his mind in devotion to the Bhāgavatas, who sing and dance with divine bliss about the glories of the Lord of Śrī Rangam whose beautiful eyes reminds one of the beauty of the soft, red lotus flower. He wanted to become one of those Bhāgavatas to get closer to the Lord of Śrī Rangam. After Kulaśekhara reflected on the nefarious deeds of his ministers, he recognized the underlining concern of his ministers for the kingdom. He immediately decided to bring his son into the picture and trained him for some time before he started on his Divya Dēśam pilgrimage throughout India singing Lord's Glories and Guṇas. He visited almost all the temples and he lost his heart for Śrī Rāma. He lived for 67 years and then reached His Lord’s abode and it is also told that his daughter Ilai followed her father Kulaśekhara Perumāḷ and was also blessed with the Lord's grace. As mentioned earlier, this Āḻvār had dreamt about pilgrimage to Śrī Raṅgam every day from his kingdom. He gave up his kingdom finally and moved to Śrī Raṅgam and reached the Lord's sacred feet there. He blessed us with 105 marvellous verses in his Perumāḷ Tirumoḷi known for their depth of Bhakti. The first three of his ten decades are about Śrī Raṅganātha. In the first decade, Kulaśekhara longs for the day, when he would be able to stand in the courtyard of Śrī Raṅganātha hugging the 2 huge pillars in His Sannidhi - that one can see even today in Śrī Raṅgam. When will that day arrive, when I can stand holding the two marriage pillars in the Sannidhi of Śrī Raṅganātha and praise Him with all the power of my tongue.